Tempered Glass, or toughened Glass, is Glass that has been heat-treated to make it stronger, more resistant to heat and break in a way to prevent injury. Tempered Glass is used in front doors, shower stalls, fireplace doors and grates, and anywhere strong, safe Glass is called for. 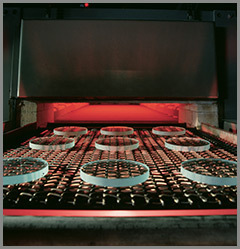 The process for tempering Glass is similar to the process for tempering steel; below are the steps for how to temper Glass.